If you’ve always wanted to get into the back of our brewery and learn all about how we make beer in our Boston facility, what ingredients go into the brewing process, the history of how DBco started and all about our partner brewing, your wishes have been granted! 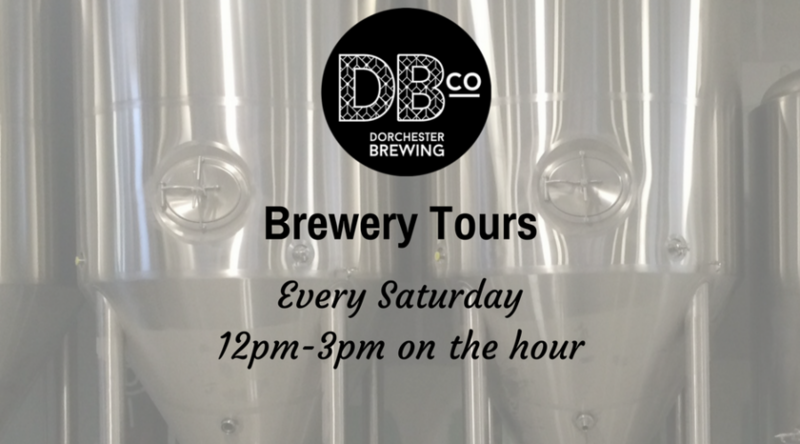 We’ve started running brewery tours in the Tap Room every Saturday. Tours will be running on the hour between 12 and 3pm. If you’d like to join, we’ll have a sign up list in the Tap Room before the tour. Tours will be limited to the first 10 people to sign up. Tours are free to the public, but we do ask that you would give a $5 suggested cash donation to a local charity. You get to choose which jar to throw your money into: College Bound, Horizons for Homeless Children and Dorchester Historical Society. We hope that you will join us and if you have any questions, don’t hesitate to reach out! As part our Meet the Team series to introduce you to the many faces behind our business, today, we’ve got the inside scoop from Matt Munsey, our Assistant Tap Room Manager who made his way to the big city of Boston from a small rural town in NH. 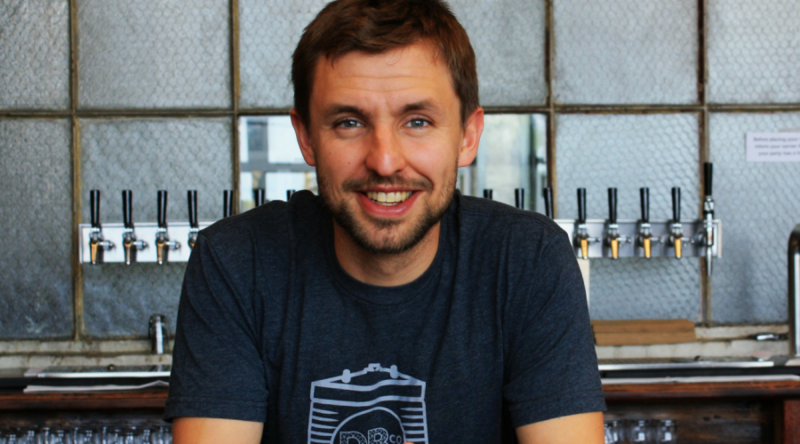 Since first developing an interest in craft beer when he tried a Belgian style beer, Munsey’s brother got him into home brewing and he developed a love of the brewing process and hasn’t stopped since then! My favorite beer style is schwarzbier, its hard to be a dark beer that is also light and crisp with a pleasant roasted quality. Favorite beer at DBco is the Embarrassment Of Riches. Favorite non DBco beer right now is probably Night Shifts Santilly, I’ve been drinking lots of it. Favorite thing about working behind a bar is the variety of interactions you get to have with people in a night. Some people are just after a drink, some want a full history lesson on beer, others are just really looking for a conversation about their day. Within the craft brewing industry, my favorite thing is seeing the ingenuity that so many brewers have put into producing a beverage typically considered “common” not so long ago. I like drinking in my back yard a lot. If I’m going out for drinks I like Highland Kitchen, Row 34, or Lower Depths. In my free time I like to do a number of things. I enjoy getting out of the city and exploring nature either on foot or by bike. Another past time is finding new places to eat and drink delicious things ( current favorite being anywhere that makes savory meat pie). In the autumn I love to race cyclocross on the weekends. As part of our “Meet the Team” blog series, we thought it would be fun to take a peak behind the scenes at our Boston brewery to show everyone how the magic really happens. You know we’ve got a talented team of brewers and some amazing staff up front in the Tap Room, but how does it all come together logistically? One aspect of how that happens is through Jim O’Neil, our Operations Manager, so we’ll take some time today showing you how Jim brings it all together! Jim went to Boston University (Go Terriers!) for undergrad and then spent twelve years working in the travel and hospitality industry. His career in beer started off as a volunteer at Blue Hills Brewery doing a lot of cleaning and helping to bottle. After paying his dues, he was hired full time as the Office Manager and then was promoted to Director of Operations with Blue Hills. 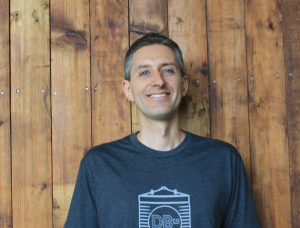 He helped manage the brewery for over 5 years, responsible for everything including inventory, payroll, sales team, AP/AR, events, social media and more. Here at Dorchester Brewing Company in Boston, Jim basically keeps everyone on track. As he said, ” In a nutshell, I work with CEO Matt and the Brew Team to make sure that they have everything they need.” Jim helps to make sure that the brewing and packaging dates are kept on schedule for our partner beers as well as ensuring that the brewery has all of the correct raw materials are on site. He also works with distributors on pick ups for the finished products. So, what does Jim drink when he’s not pouring over excel? He prefers a nice porter or stout any time during the year, especially our bourbon barrel aged version of Stove By A Whale, a Baltic Porter! 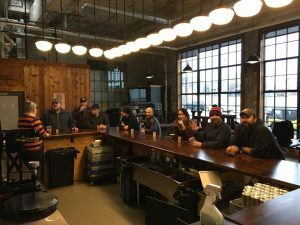 As part of our mission to highlight our contract brewing partners, today we’re featuring a guest blog showcasing a recent collaboration brew with City Brew Tours and Down the Road Beer Company, written by Malcolm Purinton, City Brew Tour Boston Guide and Beer Historian. What a fun morning! 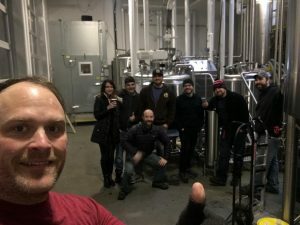 We, the guides and crew of City Brew Tours Boston, joined Donovan Bailey of Down the Road Beer Company and everyone at Dorchester Brewing today to put together our first collaboration beer ever! 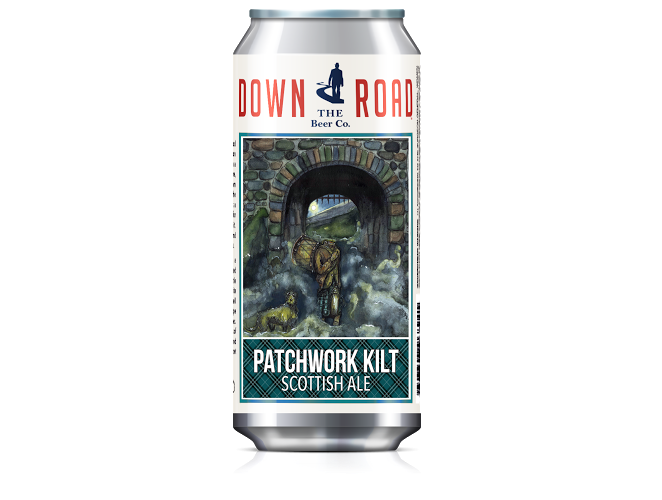 Down the Road is one of Dorchester’s partner breweries and is brewing several of its great brews on site. 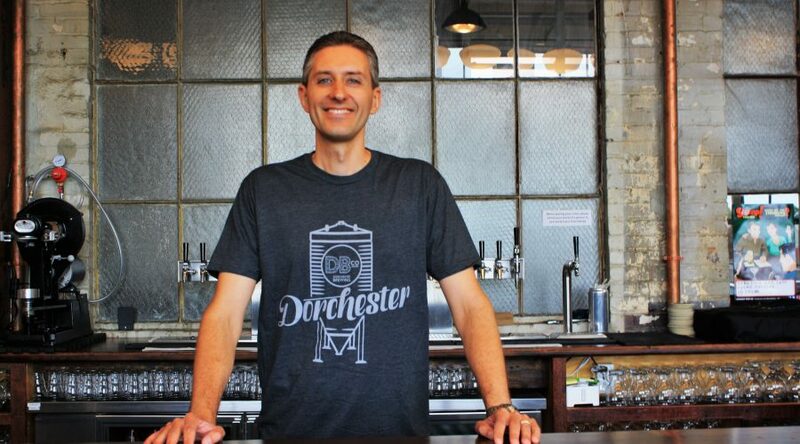 In addition, Dorchester Brewing is one of our newest City Brew Tour partners and it was a pleasure to be able to have us all in one place collaborating! Today was a rather dark and rainy day here in Boston, which made it a perfect time to be inside brewing on Dorchester’s 5-barrel pilot system! Cody, Dorchester Brewing’s assistant brewer, led the way and showed us step-by-step how they do things at DBC. He started by pouring specialty grains into the mill using the recipe that Donovan created with the Boston Brew Tour guides. Even though it was 8am, we enjoyed some delightful breakfast beer including DBco’s tart Resolution Berliner and Jamaican rum-barrel-aged Bikini Bottom. We hope ours comes out even half as good! What were we brewing do you ask? Well, a perfect beer for a frigid Boston winter: a hot chocolate flavored porter that we’re calling Wicked Wintah! We came up with the recipe and ingredients through collaboration with DBco and Down the Road by combining the flavors of Down the Road’s London-style porter with a touch of vanilla, a bit of lactose, and some cocoa nibs. It will be a delicious and cozy way to enjoy whatever this wintah turns out to be like. Here’s hoping for more snow and less rain! While the misty winter rain fell outside, Cody got our wort up to a nice boil and Matt, Dorchester Brewing Co-founder/CEO, led us on a personal tour of the brewery – including the huge freezer in the back! During the tour Matt told us all about the history behind DBco and how they work closely with their many brewing partners. Seeing how shiny and new everything was made us all very excited to show off DBco’s operation to our future tour guests! With today’s brewing complete and the Wicked Wintah beginning its primary fermentation, we cannot wait to taste it! The team and I are so grateful for the opportunity to brew with the folks at DTR and DBco! In just a few weeks, we’re going to share this Wicked Wintah porter at a release party hosted by DBco. With some sweet original artwork by Down the Road’s remarkable label artist, this brew will be packaged and available in crowlers and on draught in select locations come late January. The release party is scheduled for Friday, January 27th at Dorchester Brewing Company from 5pm-11pm. Is there a theme you ask? Yes, we felt a Wicked Wintah 80’s ski party would be RAD! If your wardrobe lacks 80s’ winter gear, just dress ’80s! 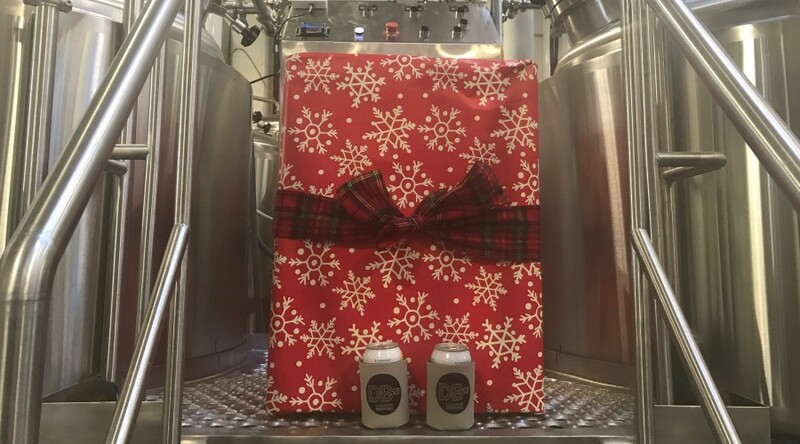 We’ll be giving away City Brew Tours swag as well as a special getaway package that includes Ski Tickets with City Brew Tours tickets. The folks at the M&M Rib Truck will be there all night! We’ll have snacks to enjoy on-hand as well as a special treat provided by City Brew Tours for the first 20 guests who purchase a pint of Wicked Wintah! Come after work, come for a night out, whatever you prefer! Either way, we can’t wait to see you there! New Year’s Eve: 12/31/16- 11:30am-12:30AM *Extended business hoursfor New Years Eve Bash! Don’t forget to stock up for your next holiday party – When you buy 4 Crowlers (32oz cans), you get a FREE DBco T-shirt through Christmas! We also have gift cards available for purchase in any amount in the Tap Room.